This week the always amazing Kara Jacobs shared a cloze activity for the new song Juntos by Juanes. Her cloze activity can be found here. It is from the new Disney movie McFarland, USA or McFarland: Sin límites in Spanish. I decided that the song would be this week's Música miércoles. I was interested in the movie so I watched the trailer below. It looks like it is going to be a heartwarming, family friendly, sports movie about a coach creating a cross country team out of a group of mostly migrant farmers in 1987 McFarland, California. The movie comes out February 20 and I am interested to see it to find out what themes are addressed (immigration, migrant farming, etc). I was hoping to find a trailer in Spanish, but so far have just found the one below with Spanish subtitles. I did find a couple great authentic articles below in Spanish that could be used to introduce the movie and song. 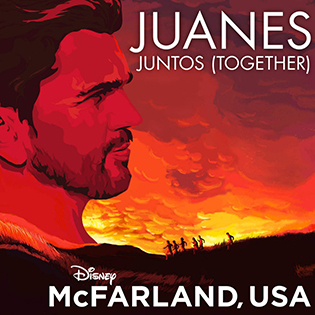 I am excited to see McFarland, USA and hear Juanes in mainstream USA! Before starting Chapter 1 of Carol Gaab's Brandon Brown Quiere un Perro I wanted to do a quick activity to introduce colors in Spanish. Chapter 1 mentions quite a few colors and I wanted to allow students a chance to discover then on their own. We had done this warm up activity when our high school students taught elementary Spanish lessons, but this was my first time completing it with high school level 1, and it was a surprising hit! Set the stage by introducing that there is going to be an individual & fierce competition. (This is the key for high engagement in my intensely competitive classes.) Have crayons, markers or colored pencils set on each table and have everyone get out a sheet of paper. Tell students their goal is to find as many colors as they can in Spanish (or French) using the labels. They will write them down in the target language, as well as color. Set a timer and let them loose. The students went from table to table so they could get the variety from different coloring utensils' shades of colors. I loved hearing the "light bulb" moments as I walked around hearing students exclaiming that they had figured our what "light" or "dark" meant by the pattern of the crayons. Speaking of which if you happen to have one of the giant sets of crayons with the very creative names, this game could go on for quite a while as students try to find them all! I had planned that this would just be a quick 5-10 minute start to our lesson, but the students were having so much fun with it that we ended up adding to their lists for a good 20 minutes. 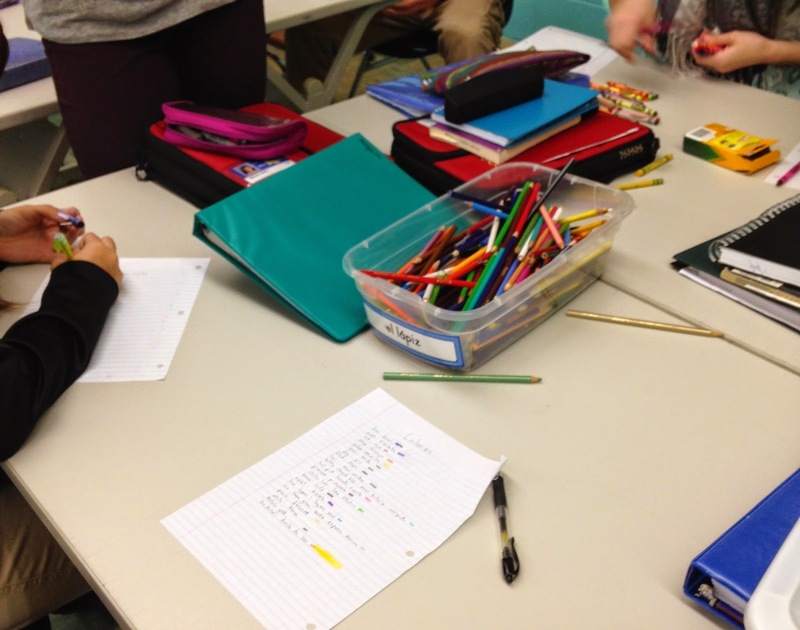 Once time was up, students traded twice to evaluate another list. They checked for duplicates and counted the number of unique colors listed. This also gave them a chance to see others that they did not have. Our winner got a goofy prize and the honor of having their name and score on the board as a goal for the next class to beat. Students ask and answer each other with the question, "what is your (least)favorite color?" Play "stand if you.." based on if they are wearing a certain colored clothing item, or have a certain color hair, eyes, etc. The most popular new option to our Choice Real World Homework this year has been #SpanStuChat. 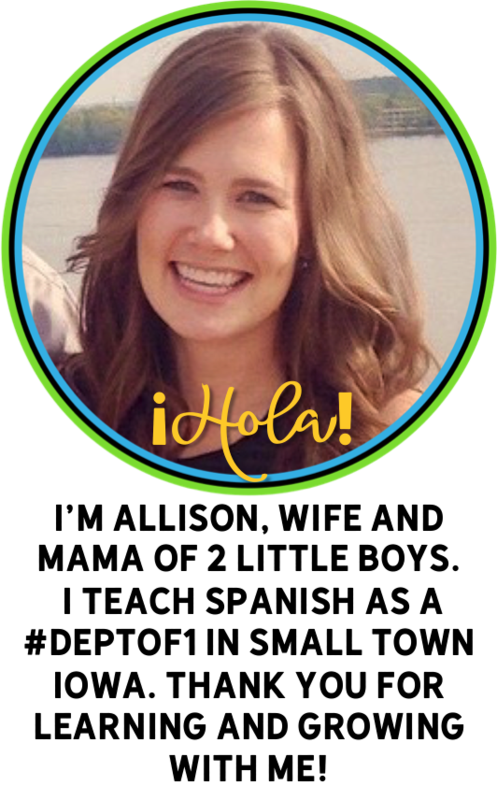 Spanish Student Chat was the great idea of Rebecca Huls (@rhulshuls) and Kara McNeese (@kmcneese1). As they state on their weebly #spanstuchat was created as a tool for students to take their learning from the classroom to the real world. This biweekly Twitter chat is meant for students and teachers of Spanish to get a chance to practice outside of school, and is an amazing opportunity for your students. I saw the #spanstuchat hashtag at the start of school, investigated it further and then added it as a 5 point community option for our Choice Real World Homework. (If they would like to earn all 5 points they must participate in real time and answer all questions). #SpanStuChat occurs on the 1st & 3rd Tuesday of the month from 8-9pm CST. 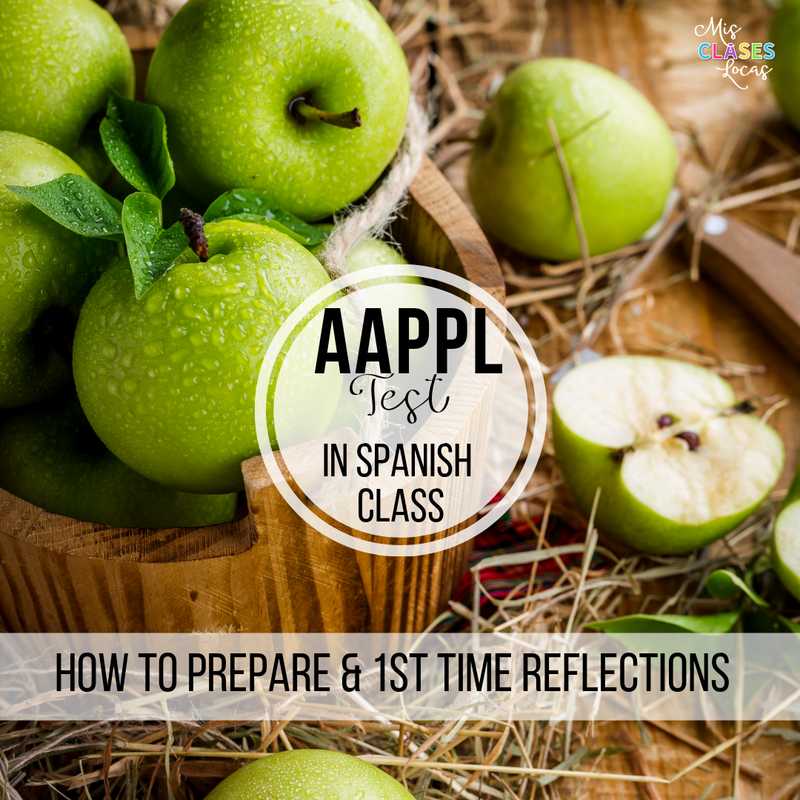 It is a Q1, A1 format from teacher or student moderators, conducted completely in Spanish. I have had many students participate this year, from all levels, and most come back with an overwhelmingly positive experience. They are pleasantly surprised with how well that they can COMMUNICATE with people outside of their school. The love getting favorites and retweets from new people and are PROUD of things they said or learned. I try to drop in using my class twitter (@DBSpanish) if baby boy's bedtime allows and it is fun to chat with students outside of class in Spanish. Most students use their Spanish twitter account that they created on the first day of school, as well as use our #DBSpanish hashtag for easy look up later for me. teaching students to use TweetDeck or other feeds makes following along easier for those new to Twitter chats. Those who have participated have gained tremendously from their engagement in the chat. This week when the word "era" came up in a lesson, one student said "I know that word from #spanstuchat!" She participated the week where the topic was about childhood and got many repetitions of this form of the word "was." 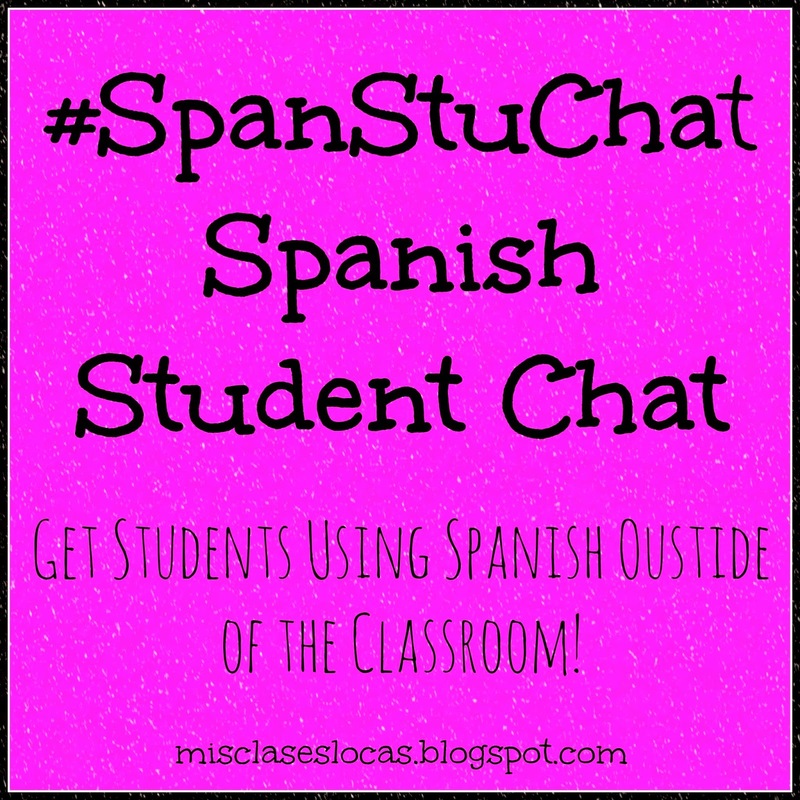 I had another student who told his friend he was not going to the basketball game because he wanted to do #spanstuchat! He was CHOOSING Spanish over a social function. Participating in #spanstuchat has both been a great learning experience for my students, but for me a well. At first I cringed when I would see an obvious grammar mistake from a student such as as "yo tiene" (I has) with the #DBSpanish hashtag attached. I would feel a slight pang of embarrassment thinking that other teachers would think less of me because my students do not always use proper grammar. But then I realized that they were PROUD because they were COMMUNICATING! 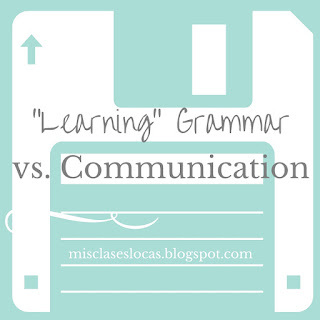 I blogged recently about learning grammar versus communication and this is a great example. In a real world situation "yo tiene" still gets the point across. Is is correct? No, but in a fast paced conversation others understood and continued to communicate. Now I would rather see a grammar mistake than a blatant translator because they are SHOWING WHAT THEY KNOW. 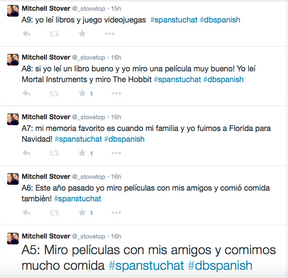 If you are a Spanish teacher encourage your students to participate in #spanstuchat! The next one will be Tuesday, February 3rd 8-9pm CST & I hope to see you there! "How do you stay inspired and not get bogged down by the politics of teaching?" This is the great question #2 posed by Carrie to Amy Lenord for her inspired #Teach2Teach blog series. 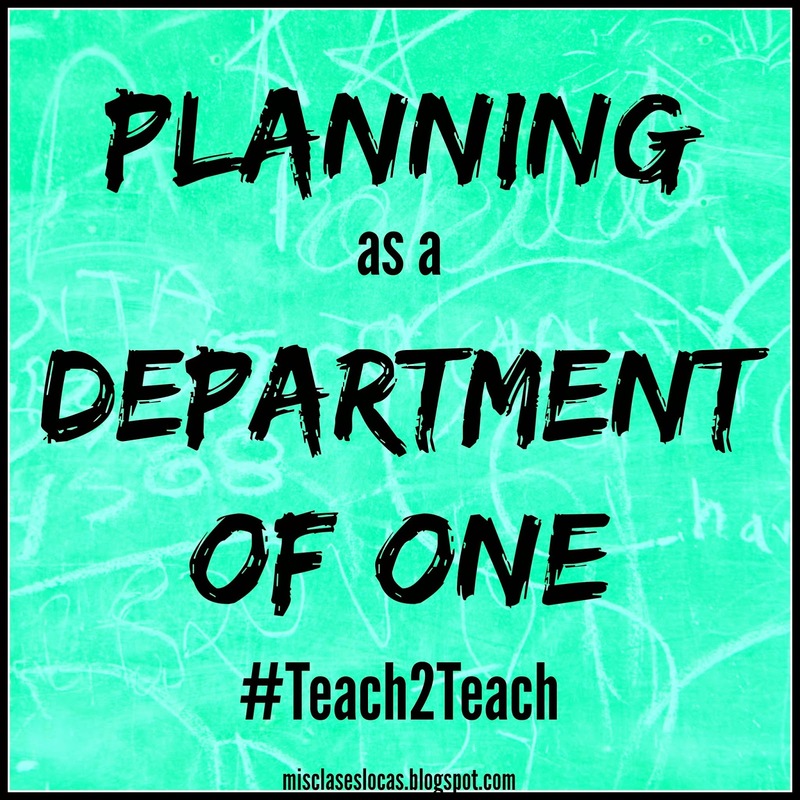 Here is my 1st #Teach2Teach Post - Planning as a Department of One. I have actually been thinking about not getting bogged down a lot lately with all the craziness that has been going on at my school. This time of year is always tense as budgets need to be approved for the following year, which usually means cuts need to be made, which means Change. Teachers who have been there forever freak out because "this is the way we have always done it." As a new teacher, you have the luxury of being much more flexible than most. Use this flexibility to spin the positive to others. Be the "positive Pollyanna" that everyone desperately needs. If there is a "negative Nancy" who you will never reach, politely avoid them and surround yourself with people who will only lift you higher. 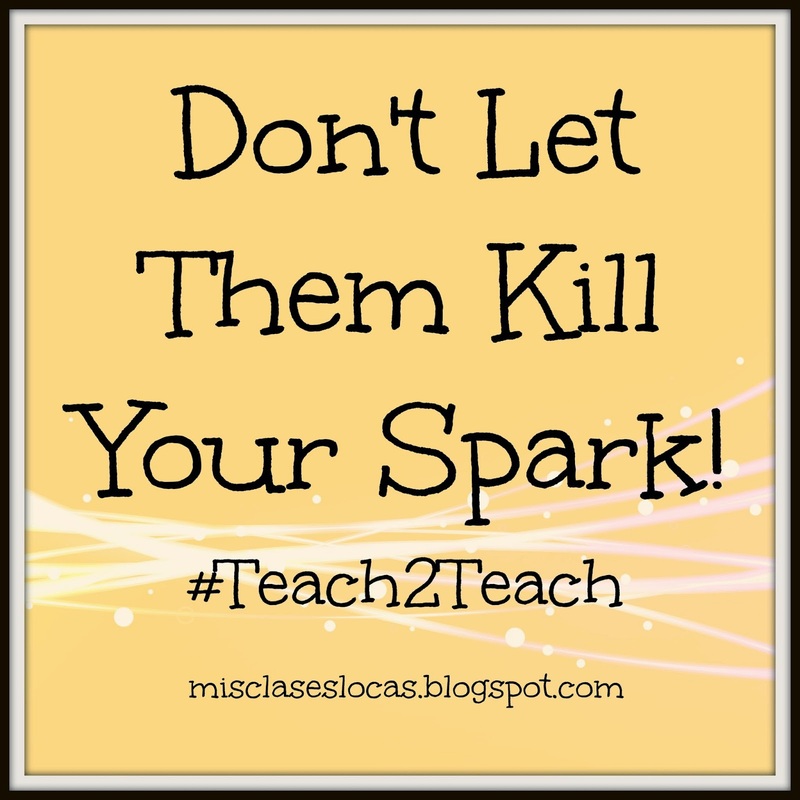 Do not let them kill your spark! Have an outlet - Like Amy said, you need to have an outlet besides teaching. For me, my outlet is Camp Adventure. On Monday nights in the spring I train university students to be summer camp counselors. We sing songs, we play games, we use positive validations, and I get the chance to passionately talk about the best summers of my life, serving the children of the U.S. Military around the world. Many of these students are pre-service teachers themselves, and their dedication and enthusiasm inspires me to leave with renewed energy. Set Boundaries - I do not work after dinner. My husband works long hours and I do not want to spend the precious time we have together working on school. Dinner and after is family time, where I engage with the people I love, relax, and unwind. I know this is a hard rule to follow as a first year teacher, but if you use your planning time well during the day, and stay after school while you are still in the zone, there is no need to spend an entire night planning or grading. You have to allow some time for those hobbies and to recharge for the next day, or you will burn out after Quarter 1. Yes, as with any workplace there will always be drama and politics. My advice is to just avoid it as much as possible. If your lounge is a toxic vent fest, invite those positive and interested to eat outside at the picnic table or in a classroom. Once again be the positive light that brightens staff and students' day. I am honestly writing this right now as a reminder to my big mouth that I just need to listen more and speak less in staff meetings. When our Christmas party started with an announcement by the finance committee that we would not be getting raises next year, I really should have just kept quiet, as it was not the time or place to be discussing it. This also goes for thinking before you act because you never know when one action out of frustration will come back to haunt you months or years later. Think before you speak, but don't let them kill your spark! What about you? How do you stay inspired and not get bogged down in the politics? Join us & use #Teach2Teach to help each other out as we learn and grow as educators. Last year I was on maternity leave during Valentine's Day, so this year I am excited to do some activities concerning the holiday of sweets and mushiness. 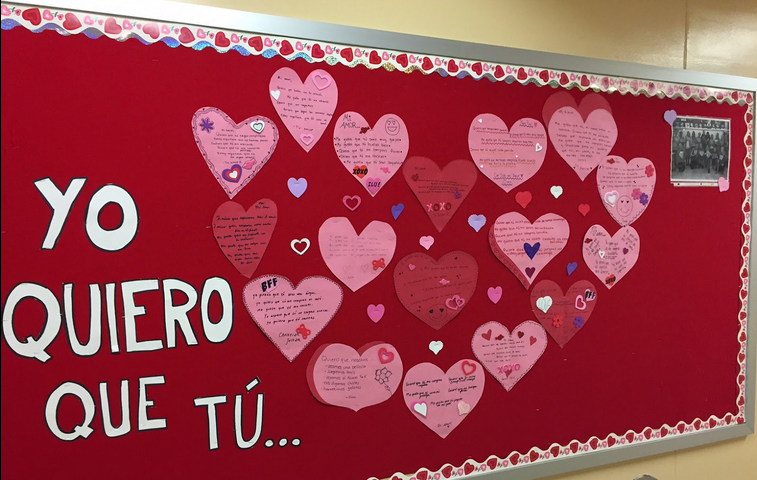 Cynthia Hitz posted this great activity for upper level students for Valentine's Day. They use the subjunctive to write "I love that you..." She has the great idea to complete them now and use it as a bulletin board this month. Two years ago I printed 10 cards from this website on pink and red paper and posted them around my room. Depending on the level the students completed different activities with these authentic cards. Level one looked for specific phrases such as "I love you" "kisses" or "Happy Valentines Day." Higher levels picked a couple to translate and write which cards they would choose for different people in their life and why. If you have technology, you could let students complete a similar activity just going to the website and searching for different cards. 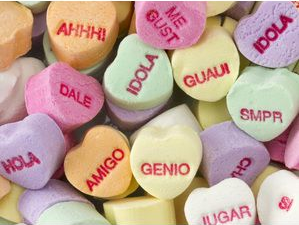 Two years ago I was obsessed with finding Spanish conversation hearts for class. After seeing you could buy them online, I started calling around to local superstores asking if they happened to have them in Spanish. I ended up scoring at my local Walgreen's, where they had accidentally ordered them in Spanish. I bought enough that I still have a stash in my classroom. While I am sure they now could break a tooth, there are many activities you could do with these cute little Spanish phrases. (You could even do them as stations). 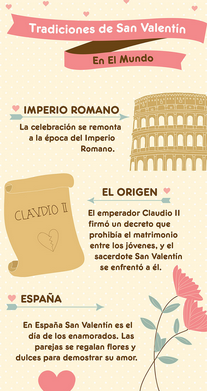 This infographic would be a great #authres to talk about traditions of the holiday all over the world, even in non Spanish speaking countries. Here is another infographic which focuses on how people celebrate and their perceptions of the holiday. I love the song and video Chocolate by Jesse y Joy for Valentine's Day. 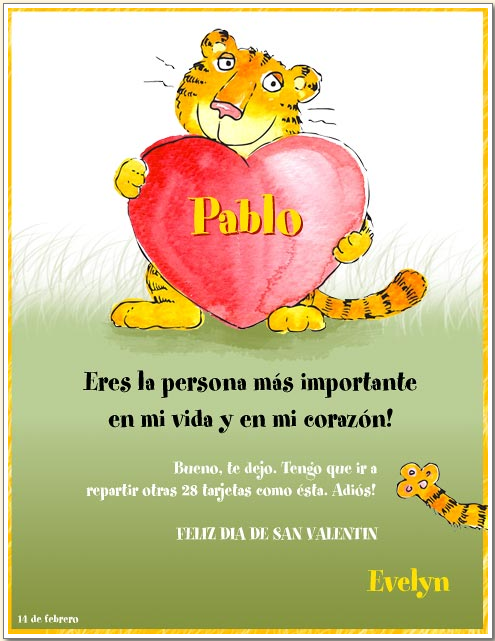 It is animated, appropriate and perfect to learn about my favorite Valentine's treat, chocolate. What are your favorite activities & resources for Valentine's Day? **Disclaimer** This post is not about foreign language teaching, but instead what I learned about teaching while being a new mom. If you do not wish to read about pumping, feel free to skip it. Today my baby boy is one year old. On 1.14.14, my life changed forever when this wild, energetic, and happy little boy arrived. I had stressed for months prepping for his arrival, planning for maternity leave, and researching raising him bilingual, but no one prepared me for the change to my life once I returned to school as a teaching (& pumping) mami. Here is my advice for returning to teaching as a new parent. I work at a school with ZERO paid maternity leave. This meant once I used my sick days, every day I was gone, was a day deducted from my salary. Before I knew I had a Spanish speaking sub I agonized about what my students could possibly do while I was gone, and planned to take the minimum 6 weeks leave. Thank goodness my wonderful husband insisted I take 8 weeks. Now looking back I would have loved to take the entire second semester off (if it fit in the budget), because like everyone says this is precious time you will never be able to get back. I am SO thankful that my first two weeks back at school, baby boy was able to stay home with Grandma, my mom for a week, and my husband's mom the second week. Going back to school is stressful enough without the added anxiety of leaving your tiny infant with a complete stranger for the first time. It was a blessing to come home to folded laundry, clean dishes, a home cooked meal and a happy baby those first couple of weeks. I know some Grandparents like to take a week off and come to help the first week at home, but if you can swing it you will appreciate them MUCH more when you are balancing not just being a new parent, but a working parent. With pumping times a day, having an extra set of parts was essential to be able to rotate the clean set. I immediately froze all milk in bags flat, and stored them in the deep freeze in gifts bags with a whole cut out of the bottom for easy rotation. Once I had a stash built up I eliminated the morning pump, because I would often run out of time. The next pump I got rid of was right after school, and eventually the before bed, because I began to hate the pump. As Sra. Spanish says it is all about Less. If you are not going to have time to grade it, then you should not be assigning it. Minimize the busy work and focus on the big picture and communicative activities. If you know you are still getting up every night for feedings, cut yourself some slack and do not plan to put on a show and dance of new TPRS stories, because I was more tired than I have ever been in my entire life the first couple of weeks back. 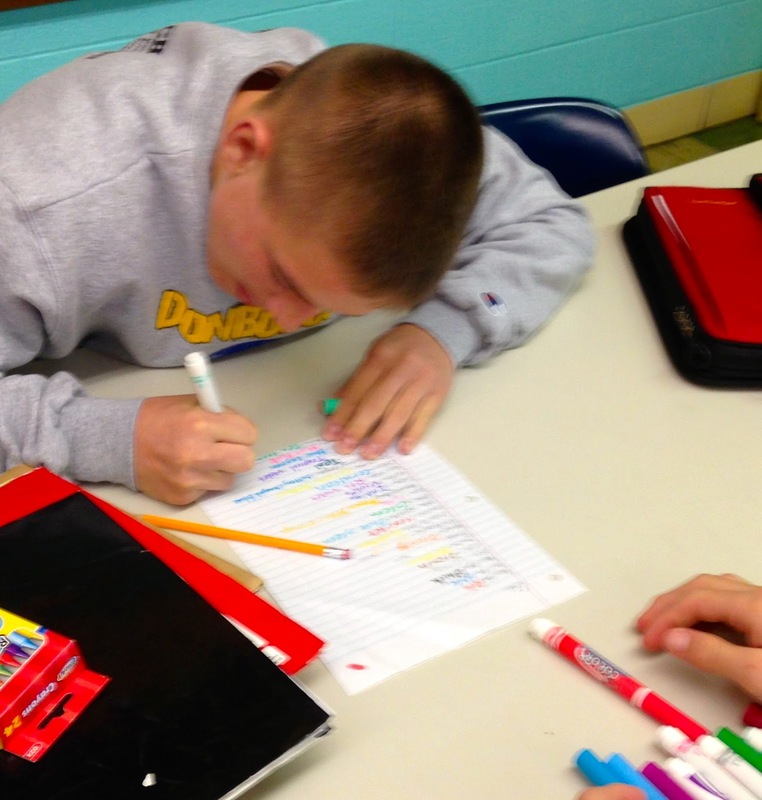 It is OK to have students assist with correcting, and actually they can learn a lot by evaluating each other in class. Finally, if at all possible, try and squeeze in planning what you will do when you return while on leave. For all of you teaching parents out there, I give you a huge round of applause because I now have a huge appreciation for the balancing act. Is there anything you would add? Happy Birthday 1st Birthday Baby Boy! 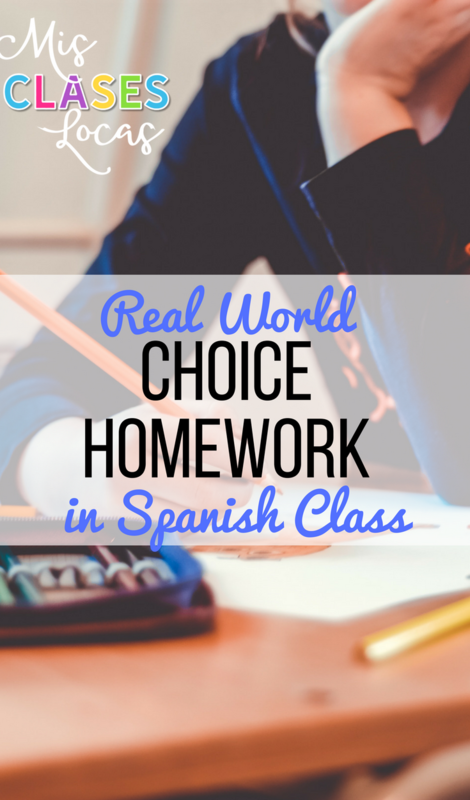 Something I started year one of teaching was "Real World Homework." I was inspired by this post by the creative language class and then bought their basic template. It is one of the few things that I did my first year that I still continue today. The students thought that it was awesome that texting or tweeting their friends was homework. I changed the template over and over for every class and unit. I loved finding new options to add and change such as lyrics training, meme martes or unit specific options such as ESPN Deportes. Real World Homework is pretty much the only homework I assign and it is only worth 10% of the total grade. Today I was inspired by Amy Lenord's post on her new movement #Teach2Teach helping pre-service language teachers. I barely feel qualified to offer advice as this is only my third year teaching, but at the same time my first year is not a distant memory, but still hits very close to home when I think about the struggles I encountered. One of my most popular posts so far is10 Things I Learned My 1st 2 Year Teaching and even though I may have learned these pearls of wisdom, it does not mean I have not repeated some of my previous mistakes. Also, I had a blog comment this week from Katie Rakas, a first year teacher in a small town who teaches Spanish I-IV, asking for advice on managing teaching all levels at once. These two inspirations bring me to my first Teach2Teach post, about my advice thriving as a world language department of one. 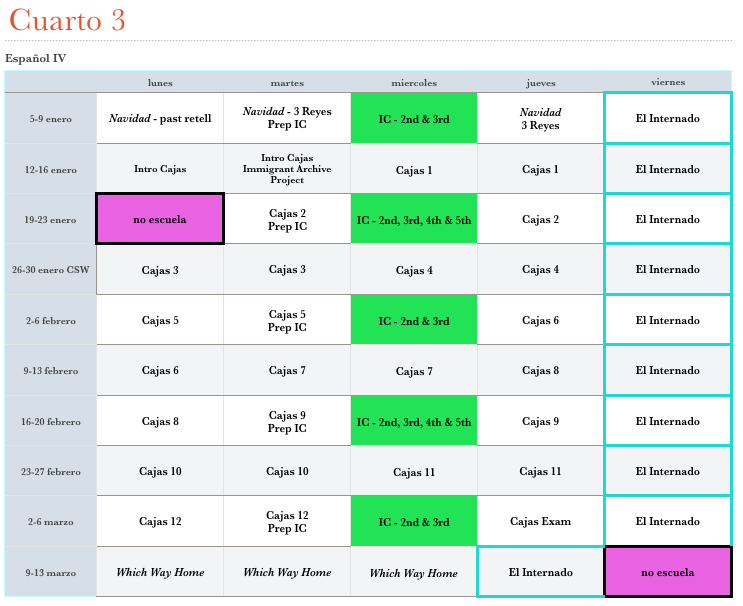 Managing all four levels of Spanish at once is HARD and requires a lot of planning, preperation, and organization. Here is my post on my Lesson Planning Process and the calendar I make to share with students. I know it is hard, but it has made a huge difference for me to pick a level and make a rough plan for the whole quarter or unit. I used to plan week, by week and was missing the big picture. This way you can plan with the end assessment in mind, and teach material that relates to that overarching goal. This does not mean you have to have every detail of every class ironed out a month in advance, but it will give you a guide to know where you are going. There is no shame in not creating your own materials. Beg, borrow and steal resources from amazing and generous bloggers like Kara Jacobs and all those I follow on bloglovin. Participate in #langchat on Thursdays at 8pm CST, follow these teachers, and pick their brains when you need inspiration. They are not unreachable as I once thought, but actually genuinely kind teachers who will go to great lengths to help you out when you are struggling or in need. I do not share many materials here, because 75% of what I do was created by someone else. If you use TPRS novels, get your school to buy the teacher's guides, and you will save your self hours of planning, and will have as close to that perfectly laid out plan as you can get. Or if you have a little bit of money, you can always check out Teachers Pay Teachers, especially Martina Bex's store for ready to go unit plans. I know some people are high and mightily against it, but it is OK to use a textbook as a guide! As a first year teacher I used the unit ideas presented in the book as a starting point. Do I think you should use the vocab lists and explicitly teach the grammar listed? No, but a Spanish 1 unit about "describing myself", or "what I like to do" is always a good idea. Take that basic unit, and find resources, authentic materials and activities online to make it your own. Do not think you need to completely start from scratch. It is OK to teach similar material across all levels. As a teacher of many levels you need to find ways to Simplify your life. One of these ways is to have shared materials across levels. For me this means that my Para Empezar bell ringers are often the same for all classes. 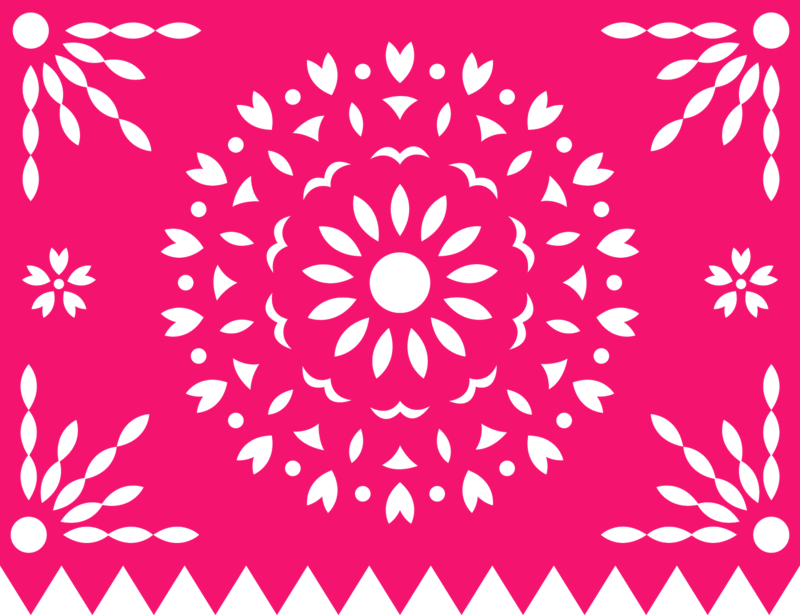 For música miércoles, all levels do the same song each week. You can then just modify your questions and discussion to match each level. This year I have started to have mini holiday units to end or start a quarter with all classes learning about the same thing. For example the week we came back from Christmas break was the start of a new semester. All my classes did a little mini holiday unit based around this unit from Martina. 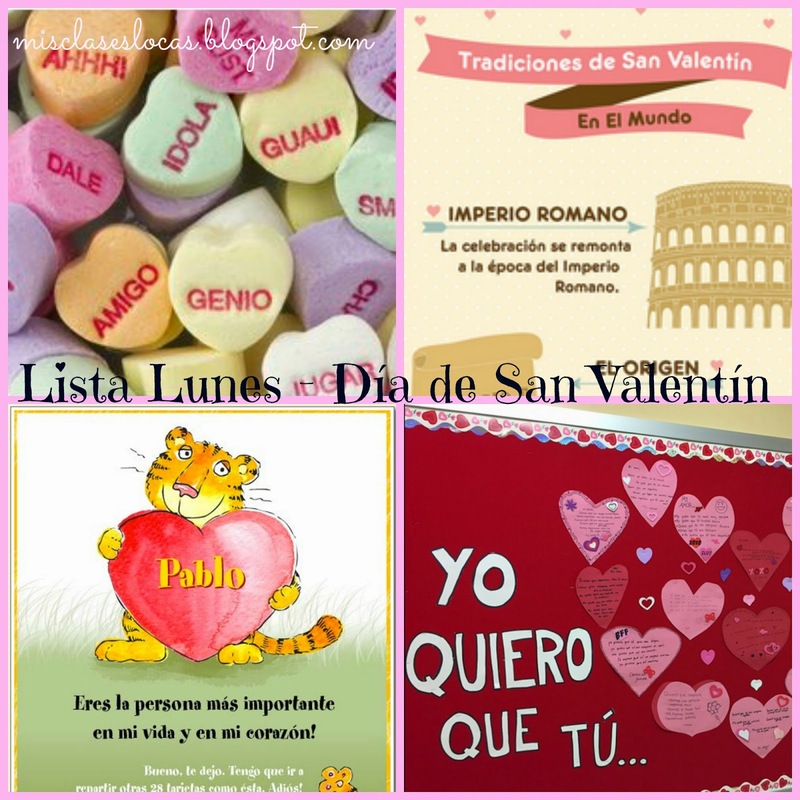 Level 1 went very slow and there was more scaffolding on my part, while levels 3&4 went beyond the materials doing more exploration of 3 Kings Day with the articles and videos on Veinte Mundos. I planned this unit before break so I could enjoy my holidays not worrying what I was doing upon my return, while this week gave me time to finalize the new units each class will be starting this week. Most of all if you need help planning as a department of one, PLEASE ASK. I would be more than willing to share what I have or guide you to those who have shared with me. You are not alone and the #langchat & #teach2teach family is here to help! If you are a new or pre-service teacher, what other advice or assistance would you like? Happy Cold/Snow Day from Iowa! This day off actually came at he perfect time. I had two days to get back into the swing of school, get ideas flowing again, and get excited to teach my wonderful students this semester, and now have some extra time to plan in between playing with baby boy. I am excited for Spanish IV to spend this quarter reading the first book I ever taught Cajas de Cartón. Year one as a teacher I knew I wanted to try and implement novels in class, but I did not know how or have the resources to do so. 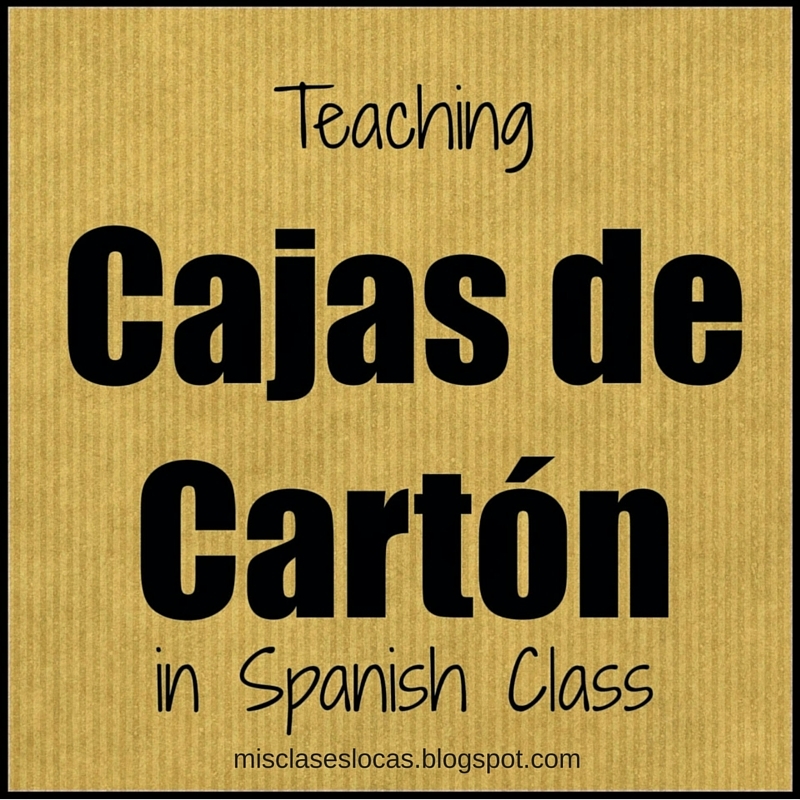 I found the original guide generously shared by Sara Elizabeth for Cajas de Cartón, a novel I had read before, so I decided to give it a shot with Spanish IV. Well the first year it went alright at best. Considering I was their third new teacher in three years their Spanish level was not exactly where it should have been and they had never read a novel in class before. It was TOUGH for them and they complained a lot. I do not blame them because I did not really give them all the tools they needed to succeed. I expected them to read and answer the questions, all on their own, and went way too fast. At first I thought we would do a chapter a day! A couple if the high achievers loved it, learned a lot, and did great with the guide, but many just tried to copy the other students' answers to get by. Year 2 went much better using the original questions. The class was more prepared for the higher level material and we went much slower. I has started learning about TPRS and spent more time reading the book out loud and using other methods to make the book more comprehensible. This year I am very excited to use the awesome Cajas E book Guide that I got my school to purchase for me. The chapter by chapter vocabulary will be a great resource, as well as the discussion and expansion activities provided. Also, this class has a good foundation and has read novels before including Robo en la Noche and La Calaca Alegre. Something I started last quarter, that worked out great, was creating a calendar for the whole quarter to share with students. This rough guide is both a great planning tool for me to see the entire unit, as well as for the students to plan ahead. I am trying to treat this Spanish IV class more like a college course, so providing them the calendar in advance allows them to plan, and be prepared for class. It also makes sure they are ready for the Elementary Lessons and Internado. Students should read the chapter before the day listed, so they will be ready to discuss in class. I am roughly planning on two days for each chapter of Cajas, which should provide us with ample time to read as a class, discuss, reflect and complete expansion activities. We are going to end the unit watching Which Way Home which I blogged about here and will be nice way to end our unit on immigration. 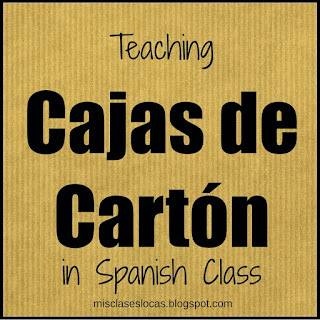 What resources do you use to teach Cajas de Cartón or immigration? 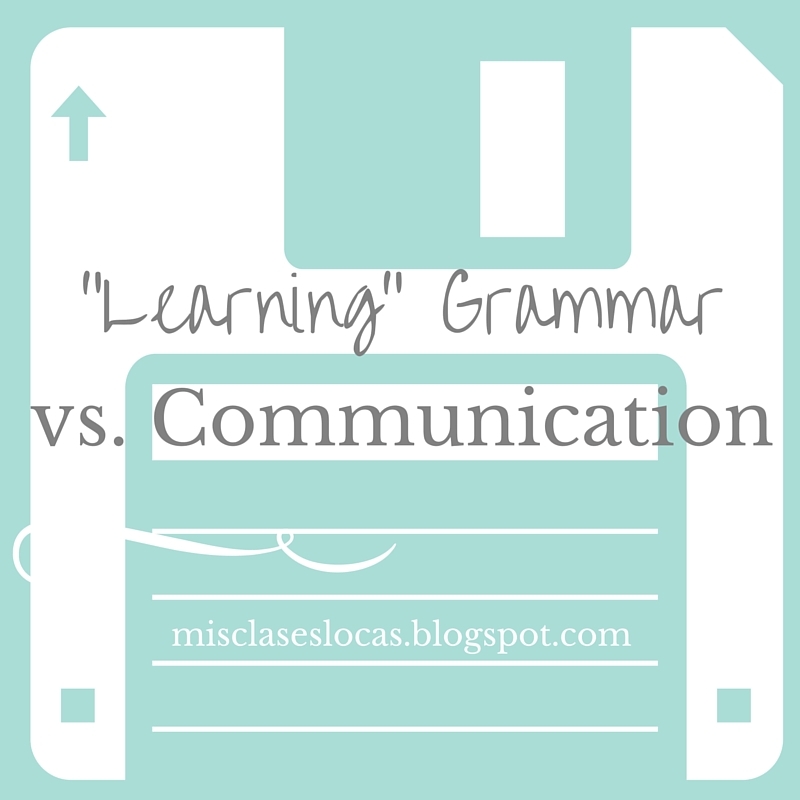 Someday I will go back to sharing ideas and resources but today I just have some food for thought about "learning" grammar versus communicating in a language class. Yesterday, a Spanish IV student brought her visiting friend from out of state to class with her. It was our first day back from break and as a fun class starter we completed Martina Bex's Una Navidad Memorable to get students talking about what they did over break. I talked about my break and then let students go to instantly start talking in the past tense with each other about what they did. The visiting student seemed appalled that we were using the preterite tense. She stated, "my school learned preterite in Spanish II" and "my school is much harder than yours." I invited the student to participate in the interpersonal speaking activity, but she declined saying something about how she was way more advanced than this activity. My first reaction was to be offended, but then I took a step back and reevaluated. I asked her about her Spanish program and realized that it is a traditional grammar driven program where right now they are learning "all the perfect tenses." She "learned" preterite in Spanish II, but could not use it today to communicate. What is the purpose of learning "all" the tenses if you can not say what you did yesterday? She is in a high level IB program, where rigor and difficulty seems to be the goal. So these high level students are cramming and memorizing how to form every grammar tense, but missing the big picture, communication! I know I am preaching to the choir but as Sara Elizabeth pointed out in this post, as language teachers we try and cover too much content. A program is deemed advanced for covering every tense, but students leave without the skills to hold a simple conversation. I am so glad that as a department of one I am not forced to each a certain amount of content in a set time frame. This year I want my focus on helping students to communicate. If students leave my class with the ability to hold a conversation in Spanish, then I have done my job.